What you place your lovely fried food on is just as important as how you place it in Dr Fry’s opinion. He has seen many tremendous fryups not really done justice by the effect a black or dark red plate can have on the way the food looks. Dr Fry really struggles with placing a fryup on square plates, some people have this talent. 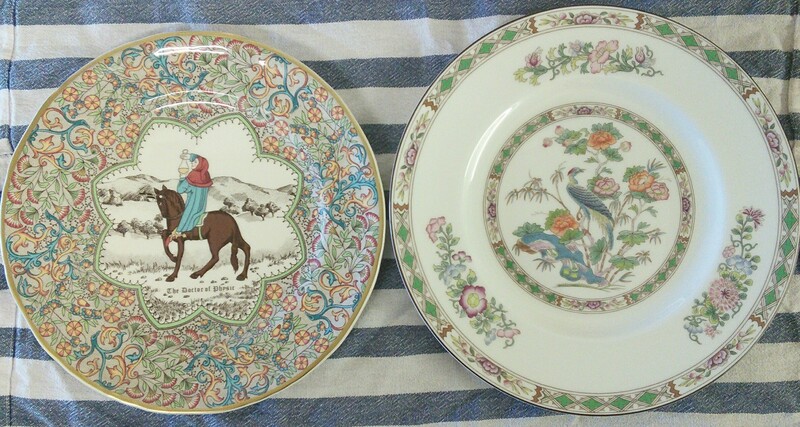 You can’t really go wrong with a nice big round white plate but Dr Fry also loves to keep lovely-looking old plates and platters out of dusty cabinets and give them a chance to shine again. To mark his recent honour, Dr Fry hit the charity shops today and came back with these for less than a Guinea each. He particularly likes the slightly smaller Mason’s Canterbury Tales one on the left, but the Wedgewood Kutani Crane one has its merits too. Both will make excellent candidates to set off a nice medium-sized lunchtime fryup.